Ten world championship titles are on the line, when within two days of competition hundreds of cheerleaders and Cheer dancers from three continents will rock Berlin’s Max-Schmeling-Halle in the 8th IFC Cheerleading World Championships on 21 and 22 November. Preparations are in full swing, not only for the actual competition, but also tight schedules for training, locker room procedures or rehearsals have to be workout. „Backstage“ a complete second version of the actual competition area will be set up, and enough head space for throws or pyramids has to be assured for that also, as the final rehearsals will be done here shortly before each team’s enters the real competition area. Well, strictly speaking there actually are two competition areas, which are alternatively used by cheerleaders and Cheer dancers, and have to be changed in between their respective competitions. Surfaces of course have to be different for cheerleaders and their gymnastic and acrobatic performance and for Cheer dancers who mainly rely on dance performances. So, a lot of diversity will provide exciting competitions. And also a vareity of entertainment for cheerleading fans from around the world for November 21 and 22. Victory ceremonies are held at the end of the second, third and fourth competition blocks. The schedule is not final and subject of changes depending of the final entries to the CWC. The “International Federation of Cheerleading” (IFC) has paved the way for the future of the cheerleading sport and this year’s World Championships in particular at their annual meeting in Berlin. That was approved approximately at the polls, where the delegates set on continuity. Re-elected to the Bureau were unanimously Robert Huber (GER) as Senior Vice-President, Liudmila Zueva (RUS) as Vice-President and General Secretary, Director Dr. Thitipong Nandhabiwat (THA) and Treasurer Noralma Endaru (ECU). Positive news there were the approximation to the World Dance Sport Federation. IFC President Setsuo Nakamura told the delegates about the cooperation and the status of membership in the World Dance Sport Federation (WDSF) and the associated advantages for the IFC. Senior Vice-President Huber added that the IFC Bureau participated at the meeting of the head of the WDSF in January and also will participate at the annual meeting of the WDSF in Granada in June. In return, a visit of the leadership of the WDSF at the Cheerleading World Championships in 2015 is planned. For Cheerleading, as in any other sport in which votes are awarded on points it is necessary to enable an objective and competent rating. For this reason, a seminar for judges is planned for the European Championships in Croatia. The successful candidates could then be used at the World Championships in Berlin. Other seminars are planned in a common language. It was decided that for the world championships in November 2015, the modified anti-doping rules of WADA will be applied and implemented. The regulations were sent to all organizations. During the congress, the three new members of Denmark, Ireland and Russia were taken unanimously in the circle of the ICF. The most important decisions were made at the end of the session for the upcoming Cheerleading World Championships in Berlin. Because great emphasis is placed on the young, the juniors will get a platform at the seniors. In what form and what competitions will be determined soon after a survey of members. New competitions at the World Cup 2015 are “Cheer Dance Doubles”, “Cheerleading Doubles”, “Cheer Leading Small Group All Female” and “Cheerleading Small Groupes Mixed”. In order to support the “Cheerleading Doubles” competition, all participants can send a team, consisting of two athletes and a male spotter, to the World Championships at the expense of the Association and of the host. The rehearsal in front of the jury was set at Friday, 20 November. For the accommodation of the teams, the organizing committee has found numerous hotels in the vicinity of the Max-Schmeling-Halle, where the Championships will take place. Short distances, good accommodation and a relatively close together are guaranteed with the chosen hotels. However, the most important decision concerns the venue Berlin itself. If the German champions in the category “Cheerleading Mixed will not come from Berlin, the German capital receives a wild card for his country selection and may participate at the World Championships in addition to the national winning team. This ensures that a “local hero” can participate as spectators magnet at the event. 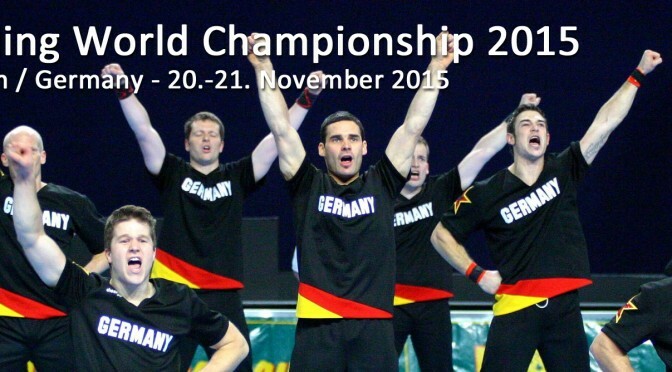 Just one year till the Cheerleading World Championship in Berlin 2015. The project “homepage” starts today. During the next weeks the homepage will be build up.